Round 7 of the Rugby Union Premiership got underway at the Twickenham Stoop as hosts Harlequins welcomed back Newcastle Falcons. Two weeks ago, the Northern visitors came and conquered their southern rivals in the Premiership Rugby Cup, a close-fought game that could have gone either way. Harlequins have so far taken points from every Premiership game this season. Newcastle were determined to start working their way off the bottom of the table. Marcus Smith kicked off proceedings for the hosts and earned an attacking line-out on the visiting 22 after Newcastle gathered the ball but kicked out on the full. The line-out was secured, a maul formed and then the wings were released. Falcons secured turnover ball and kicked deep, only for an aerial battle for territory to begin. Eventually Quins put the ball in touch, handing possession to Newcastle. The visitors knocked-on during a sloppy line-out, handing a scrum to the hosts. The set piece held firm, starting a strong period of Quins’ possession. The hosts seemed unable to progress past the Falcon defence so kicked for territory and touch. At this point play was halted whilst the visiting no. 7 John Hardie was down receiving treatment. Moments later and both teams were back to full strength. Quins stole possession in the line-out and headed for the try-line. Advantage was being played so an attempted chip through was made, only for the ball to be blocked. Referee JP Doyle signalled the scrum with Mulchrone feeding the ball for the hosts. The team inched ever closer to the whitewash but the ball was knocked-on, handing a 5-metre scrum to the visitors. This time the set-piece failed and Newcastle were awarded a free kick. They kicked for touch but Morris took the line-out quickly, allowing Quins to get straight back on the attack. Once again the hosts entered the opposition 22 but play was halted for an injured fly-half. Joel Hodgson was replaced by Tim Swiel for Newcastle just 9 minutes into the game. In a sight nobody likes to see, paramedics had to come onto the pitch to assist the team’s medical staff. A stretcher was deployed as the no. 10 suffered a suspected break to his left leg. Play resumed with another collapsed maul, and the hosts again being at fault. Falcons found touch in the Quins’ half; secured line-out ball but an accidental knock-on handed possession to the hosts in the form of a scrum. Mulchrone fed the ball. This time Harlequins retained possession and passed the ball with confidence. Morris again was strong in attack, darting through tackles before eventually being brought down. Newcastle, quick on the scene, powered through the ruck and kicked; the ball, heading into touch. Accuracy was lacking from both sides as again the ball found touch instead of Quins’ hands. More misery for the hosts as they were then penalised further. Toby Flood did not make too much distance on his clearance kick for the visitors and play resumed again within their own half. Gathering the ball, they sent it high for a chase. Mulchrone gathered for the hosts but he was hit in the air by a nervous Alex Tait. 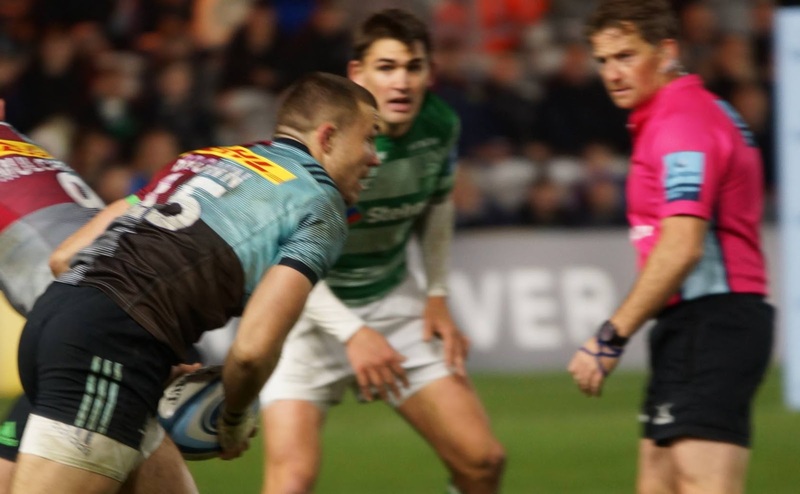 The incident was deemed a fair collision, caused by the change of direction from the Quins’ scrum-half and not as a result of the actions of the Newcastle player. Quins were awarded a free-kick which they placed into touch. Another scrum. Another phase. Another penalty and Quins found themselves back in Newcastle’s 22. They lost their line-out, however. Falcons box-kicked into touch but Morris caught the ball and took a quick line-out. Another penalty to the hosts and Mulchrone chose to run, darting tackles until a double hit brought him to ground. Momentum was on the side of the hosts who pushed up to the 10-metre line and earned a penalty. 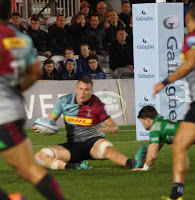 Smith lined up the posts and after 22 minutes, the first points of the game were scored: Harlequins 3 – 0 Newcastle Falcons. The restart was kicked long and returned. An aerial battle ensued until Quins placed the ball well into touch. Newcastle won the line-out but a forward pass handed a scrum to the hosts. The ball was fed, released and sent wide. Morris, in an attempt to force play on, failed in a backhand pass. The ball was knocked-on. Possession was short-lived for the visitors as again they found themselves penalised following a high tackle from Swiel. A well-placed kick to touch however was wasted when Elia Elia failed to find his mark in the line. Newcastle came away with possession. Another set-piece for the visitors, and then advantage was played after Quins was penalised for a high tackle. Flood found touch for the visitors. 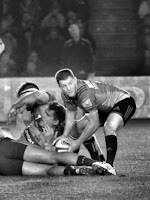 Elia Elia was then pulled from the pitch as Game Changer Max Crumpton came on in his place for Harlequins on 29 minutes. Newcastle retained possession and pushed on but play was again halted following a suspected head injury to Morris, Saili came on in his place for Quins. Morris was able to walk from the pitch with some assistance (31 minutes). Newcastle were penalised for a pre-engagement in the resulting scum and Smith placed the ball in touch in opposition territory. The hosts retained possession in the line-out and started to build up phases. They progressed to the 22 before an awkward pass made for a messy catch and knock-on from Clifford. Scrum to Newcastle. Once again the scrum collapsed. JP Doyle addressed both captains, and Newcastle kicked their penalty into touch. They secured line-out ball just over the half-way line. Quins added to their list of penalties by failing to roll away. Flood lined up the posts but pushed the ball wide. Quins remained ahead (36 minutes). The visitors were pushed back into their own half and attempted to break the defensive line with ball in hand. Newcastle then attempted a chip through which was blocked, forcing them to box-kick from the ruck. Quins gathered possession and kicked long. Newcastle, in a moment of lost concentration, allowed Dombrandt to steal possession and run in an easy try from deep. 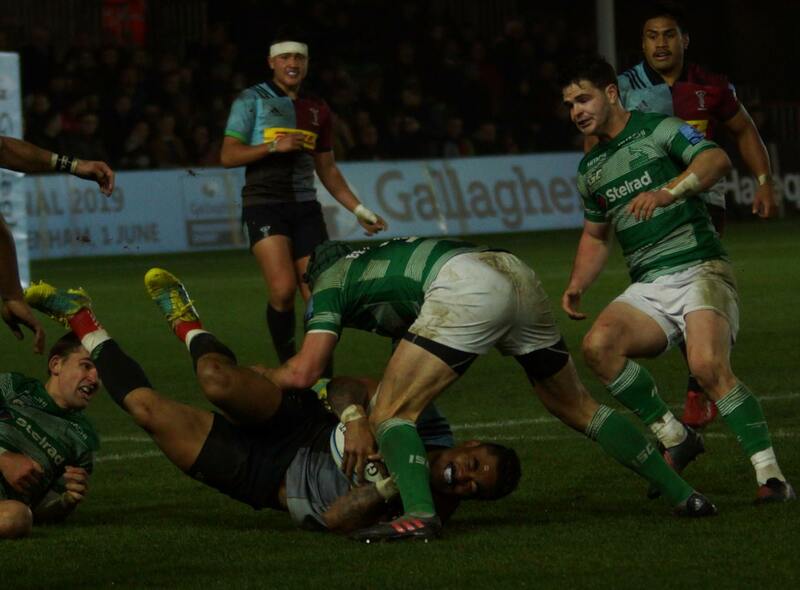 Smith added the conversion: Harlequins 10 – 0 Newcastle Falcons (38 minutes). Falcons kicked the ball deep. The hosts gathered and chose to run with ball in hand, earning themselves a penalty. Smith gained territory, finding touch and the line-out stayed strong. Quins retained possession only to lose the ball in a knock-on. The clock counted down; Newcastle fed the ball, retrieved it and kicked into touch to end the first 40 minutes. The second half got underway with an aerial battle to test each other’s nerves. Quins then attempted to barge their way out of their own half with grab-and-drive but a knock-on handed a scrum to Newcastle on the half-way line. Smith was down receiving treatment to his shoulder as play was halted. Back on his feet, and play resumed; Newcastle with the put-in at the scrum. Another collapse and JP Doyle sent Quins’ Lewis Boyce to the sin-bin for 10 minutes. Falcons kicked their penalty into touch inside the Quins’ 22 but it was the hosts who stole possession and kicked for safety, finding touch half-way. Falcons came away with possession but the Quins’ defence was strong, forcing the visitors to box-kick and hand over the ball. Another aerial battle ensued as the game seemed to have fallen into deadlock around the half-way line. Slowly Falcons put phases together. Marler came on in place of Dormbrandt as Newcastle knocked-on handing a scrum to the hosts. Once again the set piece collapsed and was re-set. The ball was fed; Mulchrone was ordered to use the ball but his long pass was lacking accuracy, putting Tapuai under pressure from an advancing Falcons attack. Penalty to the hosts who found touch deep in opposition territory, and the fans in the stands started to chant with enthusiasm. 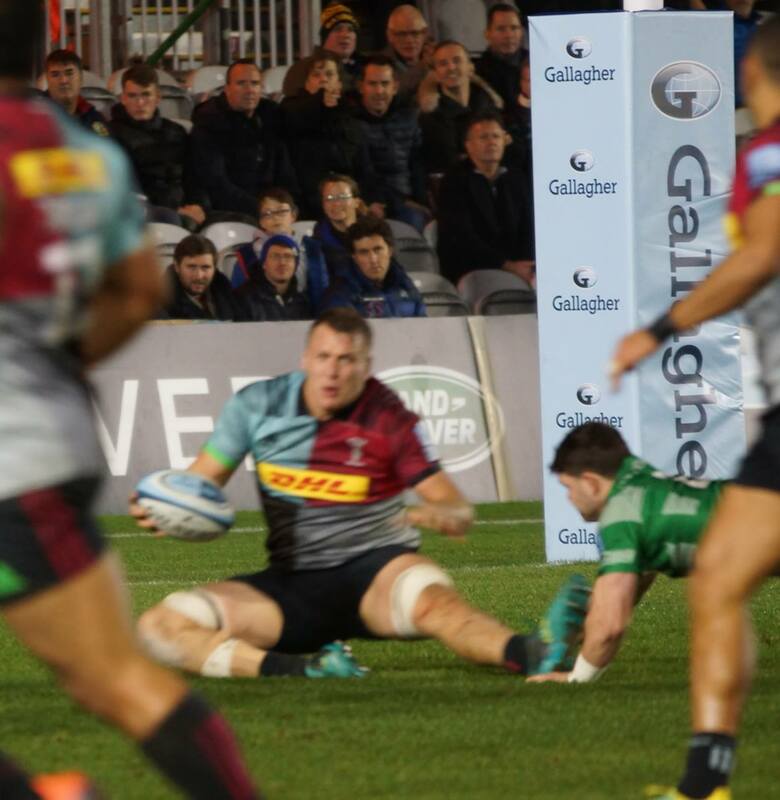 The visitors added to their penalty tally by not rolling away and Smith lined up the posts once more: Harlequins 13 – 0 Newcastle Falcons (52 mins). Newcastle chased down the re-start ball and came away with possession before knocking on. McGuigan was replaced by Cooper for the visitors as the scrum was set. The ball was fed; the scrum solid. Marchant managed to get over the half-way line before being tackled but all that territory was lost as an attempted kick was blocked – Smith having to back-track under pressure. 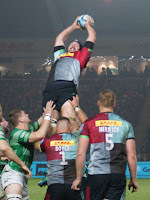 Dombrandt re-joined the field of play after Boyce’s sin-bin came to an end, and Harlequins were back to full strength. Quins, slow at the break-down, were turned over by Falcons but possession was short-lived as the visitors failed to release the ball on being tackled. Smith found touch on the half-way line. Crumpton found his mark but the ball could not be gathered cleanly. It was knocked-on by Newcastle in the fight for possession. Tensions between the teams were rising as the visitors were again penalised for illegal entry. Quins gained further territory through their kick to touch. They retained possession in the line-out and passed the ball to the far wing. Falcons put in the thumping tackles with Hardie finding his man. The home advancement was halted at the 22 and Marchant made a try-saving dart onto the ball that had come loose, with Newcastle hot in the chase. Newcastle scrum-half was switched with Michael Young coming off injured, Sam Stuart replacing him (59 minutes remaining). Glen Young replaced Calum Green. Quins had the put-in at the scrum but were penalised for illegal entry. Flood found touch for the visiting Falcons as David Wilson replaced Jon Welsh. They retained possession and miss-tackles allowed them to make their way further up the pitch. Up to the 22 line, and Quins halted the onslaught, earning themselves a penalty. Smith found touch deep in opposition territory as his final play of the game. Game Changers Dave Lewis and James Lang came on in place of Charlie Mulchrone and Marcus Smith for Quins (58 mins). Quins retained possession in the line-out and Saili crossed for a try. 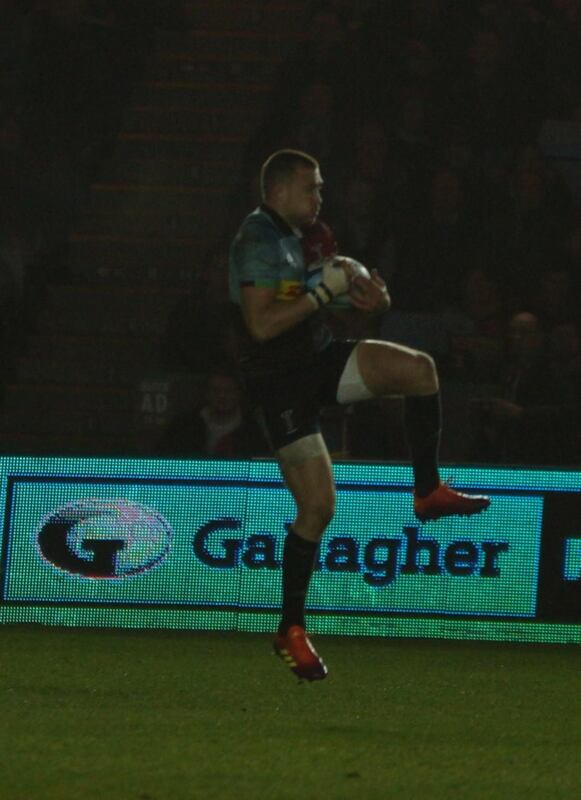 Converted by Lang: Harlequins 20 – 0 Newcastle Falcons (64 minutes). Quins’ captain James Chisholm made way for Dave Ward. Newcastle earned a penalty within a kickable distance but 20 points down, they aimed for a line-out in the Quins’ 22. Will Collier then left the pitch; Phil Swainston on in his place for the hosts (66 mins). Falcons successfully gathered the line-out ball and passed the ball with confidence. Quins kept the tackles coming in quick and fast, but Newcastle slowly gained ground. They pushed up to the 5-metre line before Andrew Davidson crossed for a try, converted by Flood: Harlequins 20 – 7 Newcastle Falcons (68 minutes). The re-start was kicked long but the high-ball was gathered confidently by Newcastle. They formed a maul and made several metres before it collapsed. Quins were awarded the scrum. The set-piece was repositioned and the ensuing penalty was awarded to the visitors. Flood put good distance into the kick, finding touch, and Falcons retained possession in the line-out. In an attempt to force play, however, they ended up juggling the ball and inadvertently knocked it forward. The clock was halted again for treatment to battered and bruised bodies on the pitch. Quins took the opportunity to replace George Merrick with Ben Glynn (73 mins). Scrum to Harlequins. Falcons challenged the set-piece but the hosts had possession and a well-placed kick from Lang bounced just before entering touch deep inside Newcastle’s territory. The visitors secured possession and ran with ball in hand, crossing the gain line time and again. Quins started to push them back as the host’s defence was quick off the mark. Despite this effort, Newcastle were awarded a penalty, which they took quickly opting to run. Soon advantage was signalled, then full penalty. Flood kicked for the corner. Quins had to defend their lines. 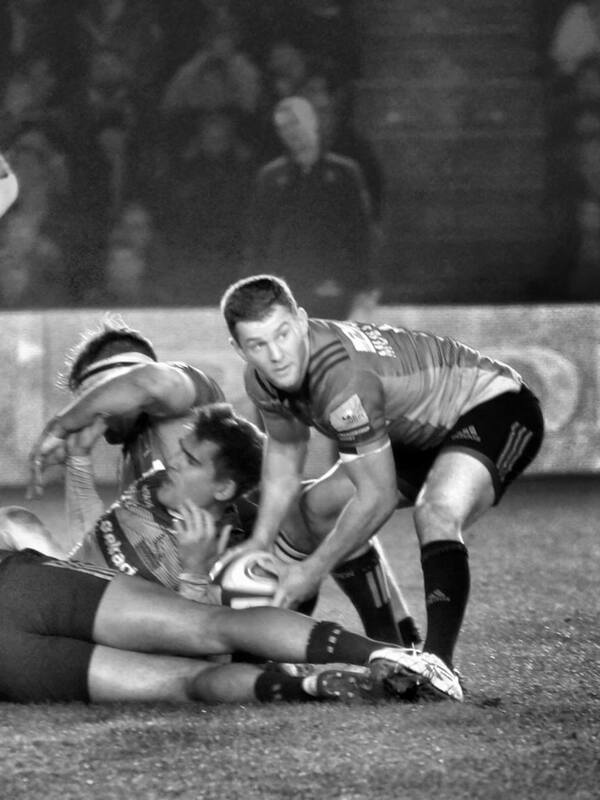 Falcons secured the ball, formed a maul, but gained very little ground before it was halted. The ball was then knocked-on under tackle handing a scrum to the hosts, 10-metres from their own try-line. The ball was fed and released quickly. Quins attempted to grab-and-drive for territory before box-kicking into touch. The hosts challenged the line-out but Newcastle came away with the ball and pushed up-field. Another fumble from Newcastle, this time Wilson was the culprit, unable to cleanly gather the ball. Quins played advantage and got the ball into the opposition half but kicked away possession. Newcastle attacked again. Staunch defence from the hosts, however, saw the visitors bundled into touch. The line-out was gathered well by Quins as the clock counted down and the ball then kicked into touch.